I haven’t been to my local farmer’s market nearly enough this year. With endless guests on weekends, it gets tough to pack it all in. Luckily, we’ve managed to pick our share of fruit including sweet cherries, strawberries, red raspberries, and blueberries…so far. I’d love to add peaches to the list and apples are for sure going to happen. Plus, the weekly CSA delivery has been a fun way to sample the local produce. Have I mentioned lately that I love living in the fruit belt of the US more so than the Bible belt? I have had the pleasure, however, of being at the farmer’s market for work (I know…my job is super!). My friend and co-worker is very similar to me and we have very similar tastes in food. We couldn’t decide what to offer up samples of…that is, until I saw this recipe. It was way too simple, classic, summery, and stunning not to try. So, we offered it up to 500 people at the market last week. We were 500 for 500. We heard not one mention of someone not thoroughly enjoying the recipe. As we, too, sampled some, we knew we had picked a winning recipe. Needless to say, the recipe went on my Weekly Menu just days later. While I think this is probably best suited for an appetizer, snack, or super light meal…I made it into a dinner meal and enjoyed 3/8ths of the recipe 🙂 I think it’s the garlic…it makes me want more and more. And more. Be sure to choose a low fat ricotta to save on calories and fat. Add plenty of garlic and be sure to salt the tomatoes ever so slightly at the end. I truly believe a touch of salt takes a killer tomato to a whole new level. 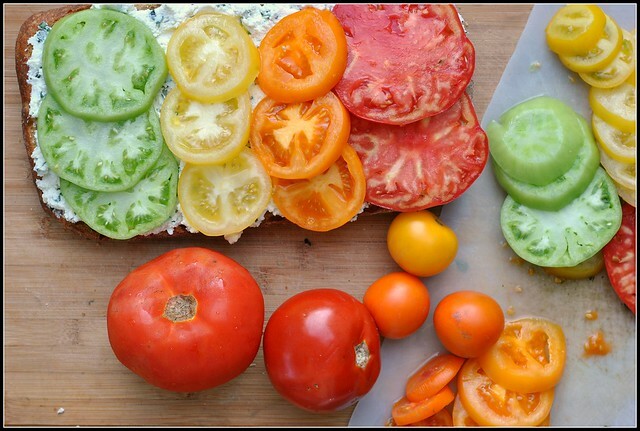 Using the various colors of tomatoes makes for a visually stunning presentation, but use whatever tomatoes you have on hand. So long as they’re ripe, they’re perfect for the job. Enjoy! Summer just hit a whole new high. 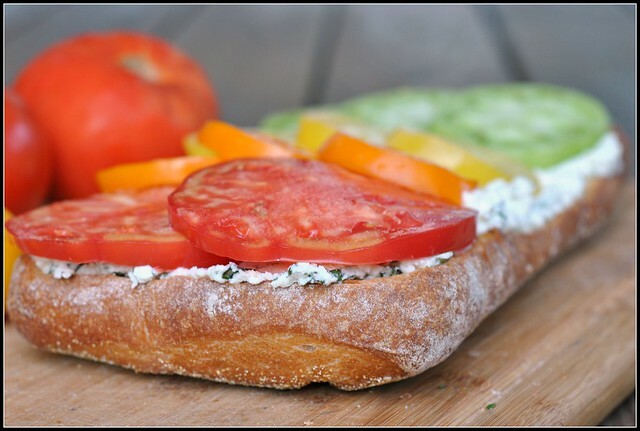 Use your ripe tomatoes spread over this rich ricotta on a quality piece of bread. You'll think you've died and gone to heaven. Arrange bread on baking sheet and mist with olive oil. Bake for 8-12 minutes or until just beginning to brown; remove from oven. Meanwhile, combine the ricotta, garlic, basil, ¼ teaspoon salt and the pepper in a small bowl. Spread the ricotta mixture evenly over the surface of the bread. Top with the tomato slices and sprinkle with remaining ¼ teaspoon salt. Serve immediately. Monday…here again. Already. Off I go. Those heirloom tomatoes look FABULOUS. I wish I could find some good ones around here but sadly I have yet to find any. 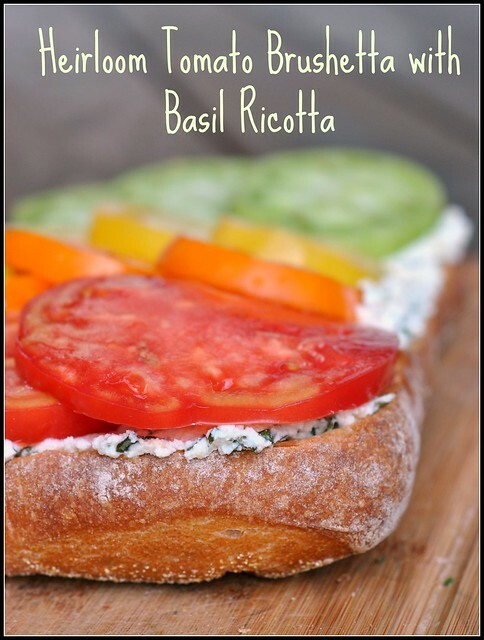 Unfortunate for me since I have a THRIVING basil plant that needs to be used in this recipe. Ah! Jealous! I cannot grow basil! Oh, this is such a great idea. I love making things like this. I’ll have to find a farmers market around here. There used to be one three minutes down the road from my new place (actually on one of my schools campuses), but I don’t know if they do it anymore. I should look into that. That looks like a fabulous meal. I don’t think I’ve ever seen orange tomatoes before – so pretty! happy Monday! 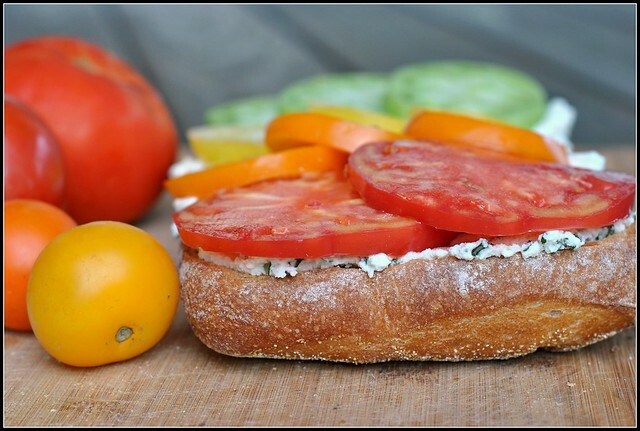 heriloom tomatoes will be purchased today at the market for this. Those tomatoes are beautiful! With basil ricotta?! I’m sold! Beautiful tomatoes! Have you tried homemade ricotta? I bought a DIY ricotta/mozzarella kit from Williams Sonoma and I am obsessed! It is a completely different texture and so stinkin’ delicious!